The Harlequin Pinscher is one of the original patterns that the Germans had, bred and registered as Miniature Pinschers. As it goes with most clubs when somebody gets in the position of authority and power and decides they don’t like something they change it irregardless of what the eventual outcome will be and the same holds true for the Merle Miniature Pinscher known as the Harlequin Pinscher. Let’s start at the beginning however and work our way to present day so you will get a complete history on the Harlequin Pinscher, it’s life, it’s diversity, it’s conflicts, it’s downfalls and it’s long awaited revival. Of course the Harlequin Miniature Pinscher history will run hand in hand with that of the Miniature Pinscher. The Harlequin Pinschers native land and place of origin is Germany. The first German documentation for the Miniature Pinscher was established in 1880. The first Breed Standard was established in 1895 by the Germany Pinscher Klub now called the Pinscher-Schnauzer Klub. The colors listed were Red/Yellow, Gray-Yellow, blue/tan, Black, Gray like iron or Silver Gray, either one color or with yellow-brow or light red marking at the eyes, muzzle and legs. Of one color, blond, or dirty gray-white or white with black spots. In my personal opinion of the standard I see this as being, Chocolate/Tan being the Red/Yellow with marking. Gray-yellow would be Fawn/Tan. Black is self explanatory, Gray like iron or Silver Gray would most likely be the Blue version. The blond would be Red, Dirty Gray-White would most likely be Merle/Harlequin and my guess is that the white with black spots was the Double Merle version of the Harlequin or it could be possible that it was actually Piebald in the breed as well. The Harlequin Pinscher was the merle, merle/piebald, piebald variety of the Miniature Pinscher that first appeared during the late 1800s. It’s true origin is unknown as at that time the merle coloring did not occur in any terrier breeds thus making the Merle Pinscher and later known as the Harlequin Pinscher the first Terrier breed to come in the Merle pattern. It is thought that small sized Pinschers were probably crossed to either some breed of merle hound or merle herding dog resulting in the merle Miniature Pinscher. The true origin however is unknown, as I previously stated, as little to no documentation was kept on the development of the breed and will assuredly remain that way. Just as the merle coloring was a variation from the normal Miniature Pinscher so was their temperament as they are more laid back and are not as suitable for use as Ratters as are the other variety of Miniature Pinscher. In the 1920’s the Harlequin version of the Miniature Pinscher became part of a controversial subject in the German Miniature Pinscher Breed Club and was unfortunately removed from the German Breed Standard and was forced to start their own breed which became known as “Harlequin Pinscher”. The Original Harlequin Pinscher breed standard established in 1923 called for it to be 12-14 inches tall being 22-26 pounds in weight. The color variations were Harlequin on a white, gray or black background having a black or self-colored nose according to coat. The early breeders of the Harlequin Pinscher however were unaware of the genetic makeup of the Harlequins and the gorgeous but semi-fatal status of the Merle gene. Over a period of years the dogs became decreasing in number due to hereditary defects. The American Kennel Club allowed the first registration of a Miniature Pinscher on March 31, 1925 which was an imported one from Germany and was listed as being “black, red, brown”. The Miniature Pinscher Club of America, Inc., was formed in 1929 and became the AKC Breed Club for the Miniature Pinscher. Prior to the formation of the MPCA the Miniature Pinscher was shown in the Miscellaneous class but was changed to the Toy Class. The Harlequin description as far as I can find was ALWAYS a breed pattern FAULT in the AKC Breed Standard and then changed to a disqualification in later years. Prior to them being a Disqualification they were allowed to be shown, only faulted in points. This in no way meant however that AKC would still not recognize them and register them as “harlequin patterned” Miniature Pinscher. The August 1935 AKC Breed Standard allowed Blues, Brown, Yellow, Red and Black and that standard was still in effect up to 1950. The size was 11.5 inches being 6-10 pounds in weight. Light color or white, very dark or sooty spots, – in listed markings were considered faults. The tail was to be 1 to 2 inches in length cropped. A foursome of Harlequin Pinschers was shown at Crufts in 1938. One breeder in the United States was known to of bred Harlequin Reh Pinschers in the “Black & White” variety as late as 1940. It has been said that there were Harlequin or spotted variety and some Brindles still being bred in or around Karlsbad, Austria, Hannover in North Germany and in Wurttemberg in South Germany as late as the 1950’s. The Blues and fawns became a MPCA FAULT of the breed standard for AKC on February 11, 1950 as they were said to be of poor coat quality and with health issues when the AKC approved the breed standard revisal submitted by the MPCA. This in no way meant however that AKC would still not recognize them and register them as their actual color as a Miniature Pinscher and even to be shown. It simply meant they were no longer allowed the privilege of being able to be shown in the sanctioned AKC dog shows without being given Fault Reduction in points. In 1950 the breed standard called for them to be 10-12.5 inches tall being 6 to 10 pounds in size. The tail standard was to be docked 1/2 to 1 inch in length. The AKC approved a revised Breed Standard on May 13, 1958 for the Miniature Pinscher which included only Black, Red and Brown as approved colors by the standard. Other colors at that time were still listed as FAULTS. The weight requirements in that revision were removed and it again became only 10-12.5 inches in height with no weight qualifications. The tail was to be 1/2 to 1 inch in length docked. The last known Miniature Pinscher registered with the AKC with the Harlequin pattern is ???????. The July 8, 1980 revised Breed Standard for AKC make ALL other colors other than Solid clear red, Stag red, Black/Rust-red, and Chocolate/Rust-red disqualifications. The tail was to be docked in proportion to the body. Height was 10-12.5 inches with no weight classification. American Canine Registry accepted into it’s sister registry, American Pedigree Registry, the first documentation to the re-development of the Merle Miniature Pinscher for pedigree documentation only in 2004. The requirement was that a one time cross could be achieved with a Merle Rat Terrier of superior quality and health and the Merle offspring from that cross was to continue the development by being bred only to Miniature Pinschers and upon 7th generation they would be accepted as purebred Merle Miniature Pinschers with documented lineage. Many years before 2004 a trio of elderly ladies had already done the Merle Rat Terrier and Miniature Pinscher cross and had already established several generations of Merle Miniature Pinschers that became later classified as F-series (*i.e. F1, F2, F3, F4, F5, F6) Miniature Pinschers in the Merle pattern. Nancy Anderson was able to trace these dogs lineage back with enough documentation to get them accepted into the foundation lineage and go from that point forward to where we are today with not only MERLE Miniature Pinschers but Harlequin Pinschers in Merle, Brindle, Piebald, Brindle/Merle, Brindle/Piebald, Merle/Piebald and Merle/Brindle/Piebald as well. Nancy Anderson not being one to stop once one goal is achieved decided to take the next step and petition ACR for a Harlequin Pinscher breed classification. 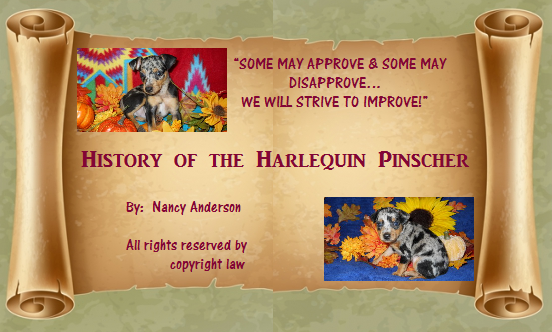 Due to the limited number of Harlequin Pinschers and the sure re-extinction of the breed associated with the Merle pattern however she was denied the request. In 2007, Nancy Anderson had worked out what she felt were the objections for the refusal to re-establish the Harlequin Pinscher breed classification and once again petitioned ACR for breed designation approval with the organization of a Harlequin Pinscher Breed Club which would document more of the one time Merle Rat Terrier – Miniature Pinscher crosses and begin a program of documentation for the F-series hybrids. After much debate and reorganization on both parties a YEA Vote was achieved and the Harlequin Pinscher Association, now known as the HPA was officially formed on October 19, 2007 with the FIRST Harlequin Pinscher officially being registered as “Run-N-Ridges Ole Time Revival N Mayhem” which had already achieved his Grand Championship status earlier in the year as a Merle Miniature Pinscher establishing his Superior Quality for being an excellent representative of the breed in which to continue the production of the Harlequin Pinscher. The first F1 dam being credited for the beginning of the revival of the Merle Miniature Pinscher or Harlequin Pinscher was appropriately called and registered as “Allie Oops” being a Chocolate/Tan Merle with the registration number of 488-591-0104-F1. The Brindle Patterned Harlequin Pinscher did not receive recognition until 2 years later in 2009. The HPA will accept for lineage documentation and registration “FOUNDATION” stock for the advancement of purebred Merle, Brindle and Piebald Miniature Pinschers known as Harlequin Pinschers. The HPA allows a documented one time cross with a Merle or Brindle Rat Terrier of superior quality and health to be used with a purebred/documented Miniature Pinscher to produce Merle or Brindle offspring which is to be known/documented as F1 Harlequin Pinschers. Each succeeding MERLE generation becomes F2, F3, F4, F5, F6 and an F7 becomes what is known as a purebred Harlequin Pinscher. The HPA rules are VERY STRICT and are to be abided by and WILL BE UPHELD WITHOUT EXCEPTION whereas ONLY 1 PARENT may be Merle and ONLY 1 PARENT may be of the F-hybrid Merle variety with the subsequent parent being that of a Purebred Miniature Pinscher of the NON-Merle pattern. It is important to keep in mind that with this program ALL offspring of Non-Pattern status is lost to the program and is considered a cross-bred animal. Only those who are genuinely interested in the revival of the Merle Miniature Pinscher or Harlequin Pinscher should take on the endeavor as it is without doubt a very costly and time consuming one. THE FOUNDATION STOCK Registry was discontinued January 1, 2017. ACR will be the parent club for HPA with HPA being the Harlequin Pinscher Breed Club for ACR. ​ ACR will be responsible for the distribution of Registration papers. On January 1, 2017 policies were established to preserve the Harlequin Pinscher breed from irresponsible breeding. ​ DNA profiling of all males used for breeding. DNA profiling of Dams having 3 or more litters. ​CLEAR test results for MPS VI, PLL and Cystinuria. A Merle x Merle breeding is considered unethical. Litters from Merle x Merle breeding are not eligible for registration.